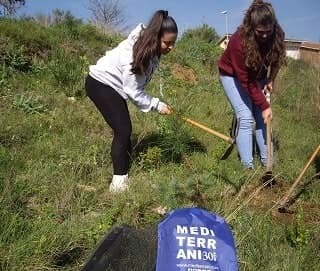 Graduated students in Tourism, Degree in Marketing and Vocational Education & Training of Tourism of the University School Mediterrani have realized on Saturday 18 of February a planted of trees to the park of the Muntanyeta of Sant Boi de Llobregat. This activity is part of the action to fight against climate change that EU Mediterrani has pioneered as university center in our country since 2009 and consists of delivering 0.7% of the amount of all enrollments to the Fundación + Árboles, an institution that promotes regeneration and respect for the environment through sustainable reforestation. On this occasion the students have been able to experience firsthand the satisfaction of planting different species of native trees such as carob trees, olive trees, oak trees, oaks, pine trees or arbutus trees. They have also been able to learn the planting technique created by the Japanese Fukuoka called Nendo Dango, which consists of making clay and earth balls where a seed surrounded by nutrients formed by cereal seeds is harvested in the interior, using black pepper as a repellent for the animals, in this way reforestations of up to 900,000 trees in a single day, simply throwing the balls from an airplane over the affected areas for example by a forest fire etc … We also want to thank Fundación + Arboles for the good organization of the activity both in terms of safety and for the explanations imparted by the person in charge of the same Sylvain Juilles. This plantation has been an experience highly recommended both by the staff of the center who has participated as well as by the students of EU Mediterrani, who has been able to return part of the CO2 that we emitted with our academic activity, with the objective that serves as example for other institutions and among all we can take care of the planet a little more.